Multi Split Air Conditioners have all the benefits of a Split system with the ability to condition two or more rooms from the one system. This is achieved by connecting multiple indoor units via refrigerant grade piping to one outdoor unit. These multiple indoor units can then be mounted in a number of rooms throughout the building, providing conditioned air where ever it’s required. The versatility of Multi Split Air Conditioners also allows each indoor unit the ability to individually control the conditions in the space they occupy. This means different temperatures can be maintained in different rooms at the same time. It can keep the occupants in each room happy without having to compromise on their comfort level. Multi Split Air Conditioners have a range of indoor units available to suit various installation requirements. High wall indoor units, floor/ceiling indoor units, ceiling cassette indoor units and even slimline ducted bulkhead indoor units give the flexibility to meet your needs. A combination off all these can also be used in the one installation. Fully Airconditioned only sell and install highly efficient Daikin, LG and Fujitsu Multi Split Air Conditioners and as Authorised Dealers for Daikin and LG can provide quality after sales service on all the systems we supply. Multi Split Air Conditioners are available in a wide range of capacities to suit any installation. Check out what we can supply and install in the Daikin, LG and Fujitsu range. 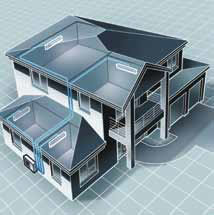 Call us for an obligation free quote on a quality installation to suit your needs and budget.